In recent years, the risk of allergy to chlorhexidine is increasingly recognised. In this review, we discuss why the allergy is so easily overlooked and point out several preventative initiatives that can minimise the risk of both chlorhexidine sensitisation and allergy development and accidental re-exposure in patients with chlorhexidine allergy. Testing for chlorhexidine allergy is also discussed. Numerous reports have been published from many different specialties. Symptoms range from mild skin symptoms to life-threatening anaphylaxis. Testing for chlorhexidine allergy is based on skin testing and in vitro testing. Recently, it was found that both skin prick testing and specific IgE have high sensitivities and specificities. 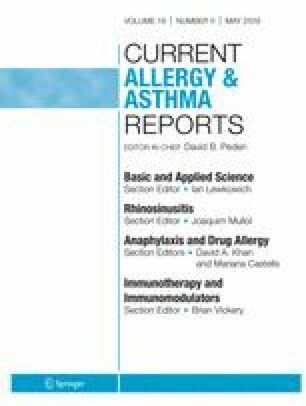 This review gives an overview of chlorhexidine allergy with a special focus on preventative initiatives and testing. There are no external sources of funding. GBE Jemec has received honoraria from AbbVie, Chemocentryx, Coloplast, Incyte, Inflarx, Novartis, Pierre Fabre and UCB for participation on advisory boards, and grants from Abbvie, Leo Pharma, Janssen-Cilag, Regeneron, Sanofi, Astra-Zeneca and Novartis for participation as an investigator, and received speaker honoraria from AbbVie, Boehringer-Ingelheim, Galderma and MSD. He has also received unrestricted departmental grants from Abbvie, Leo Pharma and Novartis. LHG is an adjudication committee member for Merck, New Jersey US and Novo Nordisk, Denmark. MSO has no conflicts of interest. The chemical structure of chlorhexidine. https://da.wikipedia.org/wiki/Fil:Chlorhexidine.png. Accessed 24 Feb 2019. Totty J, Forsyth J, Mekako A, Chetter I. Life-threatening intraoperative anaphylaxis as a result of chlorhexidine present in Instillagel. BMJ Case Rep. 2017. https://doi.org/10.1136/bcr-2017-221443. Bahal S, Sharma S, Garvey LH, Nagendran V. Anaphylaxis after disinfection with 2% chlorhexidine wand applicator. BMJ Case Rep. 2017. https://doi.org/10.1136/bcr-2017-219794. The Therapeutic Goods Administration safety update on the risk of anaphylaxis caused by chlorhexidine in central venous catheters. https://www.tga.gov.au/publication-issue/medicines-safety-update-volume-3-number-3-june-2012. Accessed 24 Feb 2019. Warning from New Zealand. https://medsafe.govt.nz/profs/PUArticles/June2013Chlorhexidine.htm. Accessed 24 Feb 2019. The Medicines and Healthcare products Regulatory Agency alert regarding the risk of anaphylactoid reactions caused by chlorhexidine in medical devices and medicinal products. https://www.gov.uk/drug-device-alerts/medical-device-alert-all-medical-devices-and-medicinal-products-containing-chlorhexidine-risk-of-anaphylactic-reaction-due-to-chlorhexidine-allergy. Accessed 24 Feb 2019. The risk of chlorhexidine allergy evaluated by Health Canada. https://www.canada.ca/en/health-canada/services/drugs-health-products/medeffect-canada/safety-reviews/summary-safety-review-topical-antiseptic-non-prescription-chlorhexidine-products-potential-risk.html. Accessed 24 Feb 2019. FDA warning of serious allergic reactions caused by chlorhexidine. https://www.fda.gov/drugs/drugsafety/ucm530975.htm. Accessed 24 Feb 2019. European Association of Urology. https://uroweb.org/guideline/urological-infections/. Centers for Disease Control and Prevention recommendation of chlorhexidine impregnated central venous catheters when it is expected to be there for more than five days. https://www.cdc.gov/infectioncontrol/guidelines/bsi/recommendations.html. Accessed 24 Feb 2019. Guidelines on the Perioperative Management of Patients with Suspected or Proven Hypersensitivity to Chlorhexidine. Australian and New Zealand Anaesthetic Allergy Group (ANZAAG). http://www.anzca.edu.au/documents/ps60bp-2015-guidelines-on-the-perioperative-manage.pdf. Accessed 24 Feb 2019.